• Chihuahua dog breeders are listed below alphabetically by State / city. • Click on underlined words to see their Chihuahua puppies for sale. • Please tell the Chihuahua breeders with puppies for sale that you found them on BreedersClub.net. The tiny Chihuahua's name is derived from the State of Chihuahua in the country of Mexico where it appears to have first been bred. Originally, these very small dogs were owned primarily by the wealthy class. They can be found in a variety of colors, either solid or splashed, and with either short or long coats. They make good family dogs and are best kept inside. AKC Registered puppies. Holistically Raised, Organically Fed. Quality pups not Quantity- Weaned naturally by their Mother when each is individually ready (no trauma). Puppies are raised on our Oregon Forest Country Estate. No Dog runs or cages here. From 8 weeks onwards we take daily walks in the forest to let our little ones grow stronger & more balanced in body, mind & spirit. 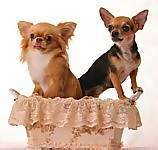 This breed directory page features Chihuahua dog breeders with puppies and/or adult dogs for sale. Once you purchase your new found friend, you will want to provide it the best in pet health care. Be sure to visit our online discount pet supplies catalog and order NuVet Plus™ to keep your puppy and adult dogs in top condition. The discount catalog also features collars, leashes, carriers, general pet care products and much more. BreedersClub.net does not pre-screen the Chihuahua dog breeders who advertise their puppies and dogs for sale in the BreedersClub.net breeder directory and in the classified ads. We require all advertisers to agree to our advertising terms. You should ask the Chihuahua breeders you talk with for references from past buyers and veterinarians.